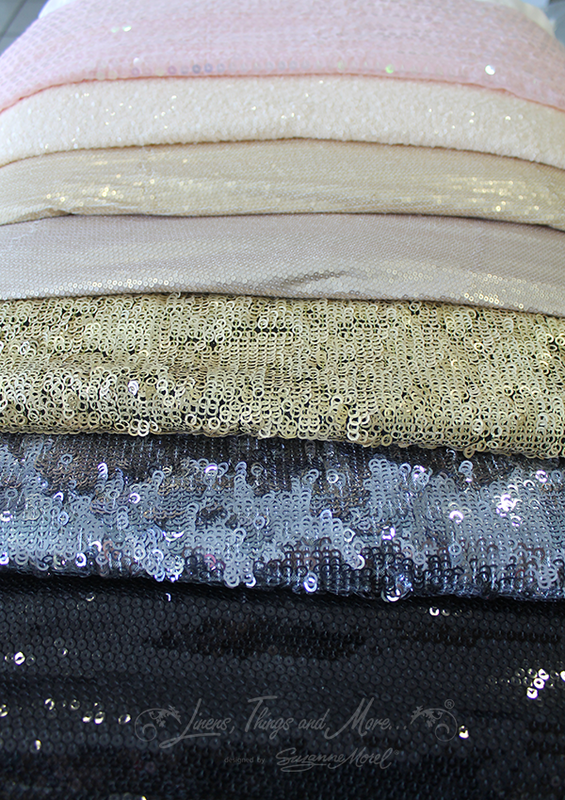 Nothing says “celebration” like gold, silver, sequins and sparkles! If you just love the glamorous metallic look, then take a look at our metallic décor collection and get inspired to let your love shine in Los Cabos! When it comes to metallic décor, a little bit of shine goes a long way. At Linens, Things and More…,we take the time to understand your vision as a couple so we know best which details to highlight and which ones to keep neutral. 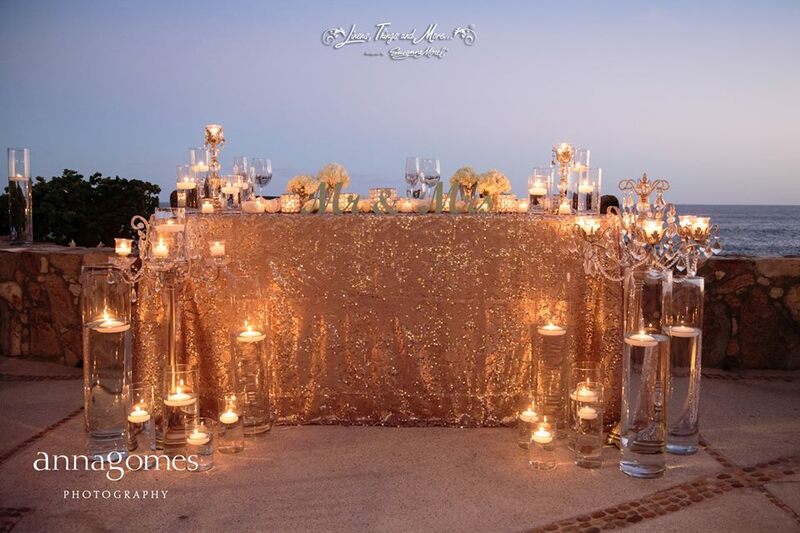 One of our most popular sequined metallic designs features sequined linen over the entire sweetheart table. This look sets your sweetheart table apart from the guests’ tables in an extra special way, and also ensures you and your partner will be the center of attention! 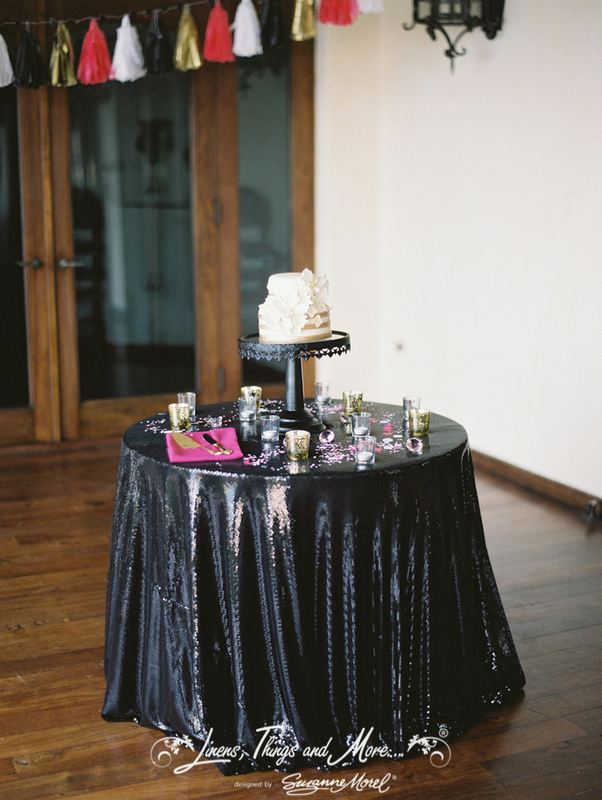 Another eye-catching piece that will really wow your guests is our sequined table runner. We can customize your runner in the popular chevron design, or we can incorporate a solid metallic color if it better suits your overall theme. 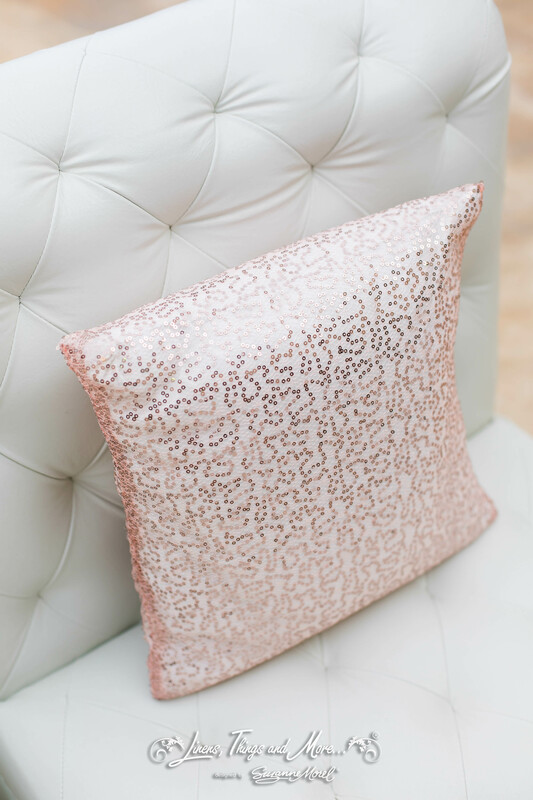 We also love to combine a patterned sequin fabric with a solid one to give your tables and chairs an entirely different look. When it comes to accent pieces, one particular metallic décor look we love is the flat silver- or gold-painted vases, votives and picture frames. 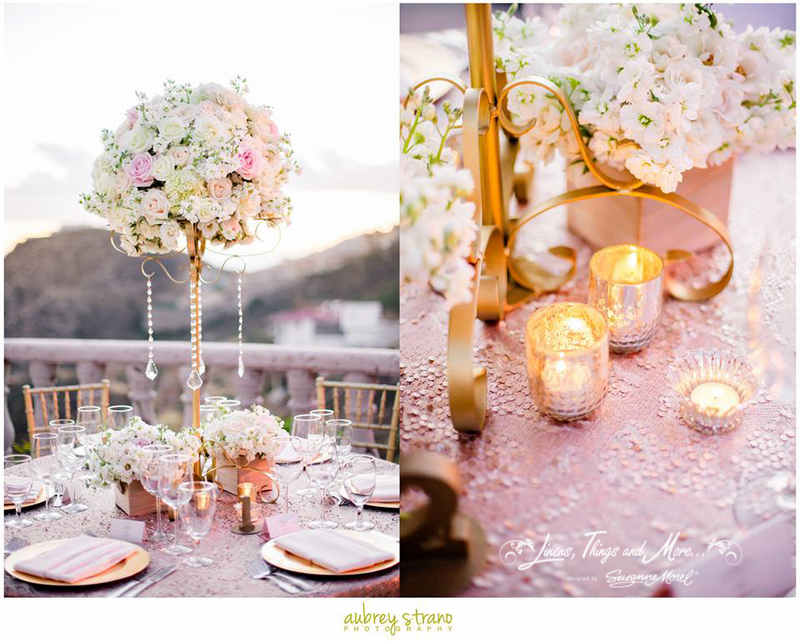 These décor accents are upscale and trendy when paired with white or ivory flowers, and we also love this look with blush-colored florals as well. 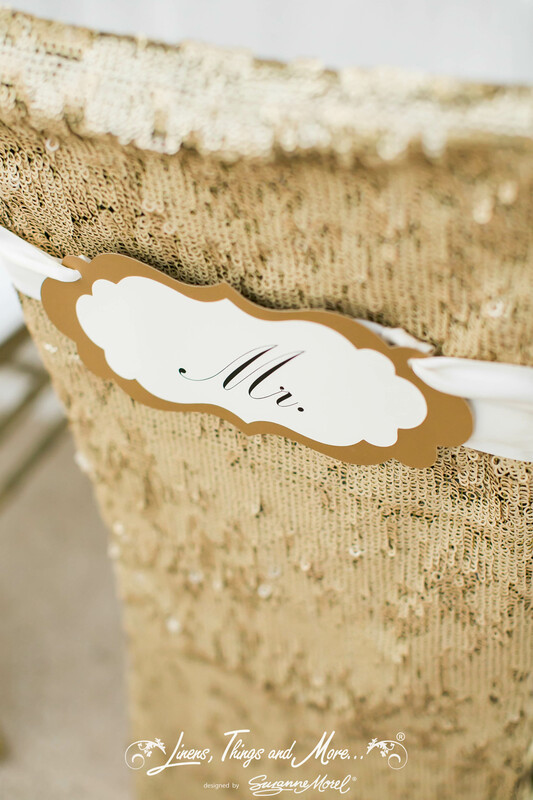 Other ways to add the metallic look to your wedding or party décor include sequined lounge pillows, gold or silver chargers, sparkly chair jackets and even our gold infinity chairs themselves! 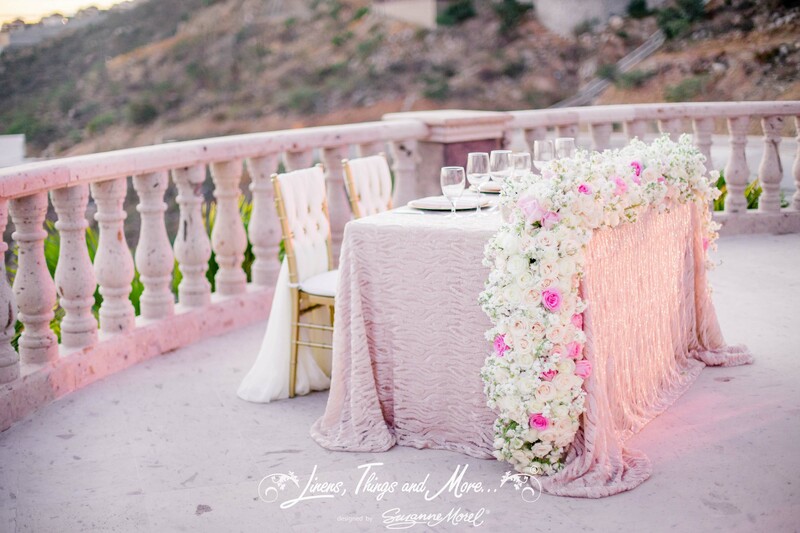 No matter how much or how little shine you wish to see, we guarantee our expert event designers will impress you and your guests with a sophisticated, custom décor collection just for your Cabo wedding or private party. Give us a call today to find out more about how to let your love shine in Los Cabos! This entry was posted in Accessories and decor, Cabo event design and decor, Special Event Decor in Cabo, Weddings and corporate events decor and tagged Cabo event design, Cabo sequin wedding linen, Cabo wedding decor, Cabo wedding design, chevron sequin decor, glamorous wedding decor, gold accent wedding decor, gold wedding details, metallic wedding decor, sequin chair cover, sequin event decor, sequin table linen, sequin table runner, sequin wedding pillow, silver wedding decor, sparkly wedding decor.